Here's an excellent example of a well crafted Transvair (Corvair conversion on a VW Transporter) done by Trevor Bessy. These photos are of his '70 pop-top Westfalia taken at Buses by the Tunnel '99, an annual Limbo event in North Adams, MA. 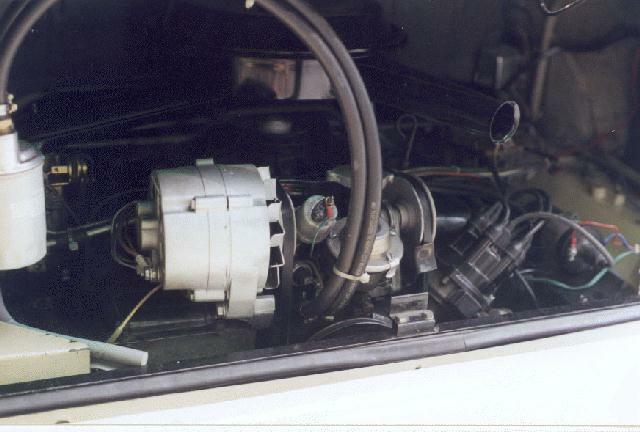 The engine and transmission are both from a Corvair. Trevor mentioned that the shift linkage was available for the bus in a kit. 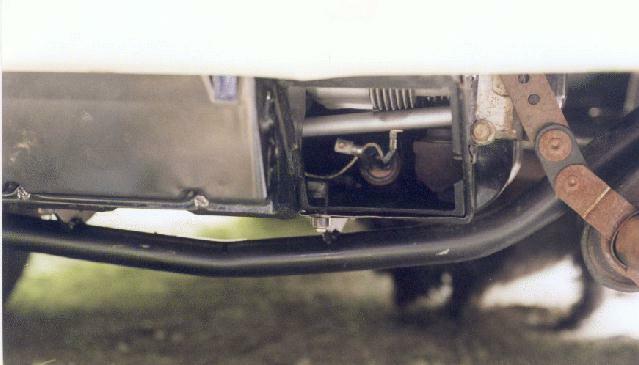 The linkage runs along the outside of the stock VW linkage tube, down the center of the bus. An especially nice aspect of this conversion was the attention to detail and efforts to modify only a miniminal amount of the stock bus metal. He mentioned that the conversion kit expects the installer to cut out the bus body metal that surrounds the stock engine so that the Corvair tin will fit. Instead, he adapted the instructions in the kit and cut instead the Corvair tin and preserved the surrounding bodywork as much as possible. Even the bracket for the full flow oil filter was cleverly clamped on using bolts through existing holes. The only incisions made to the surrounding metal were two vertical cuts, one cut on either side, just below the gas tank firewall. That was so the surrounding metal could be pushed to the sides for clearance. 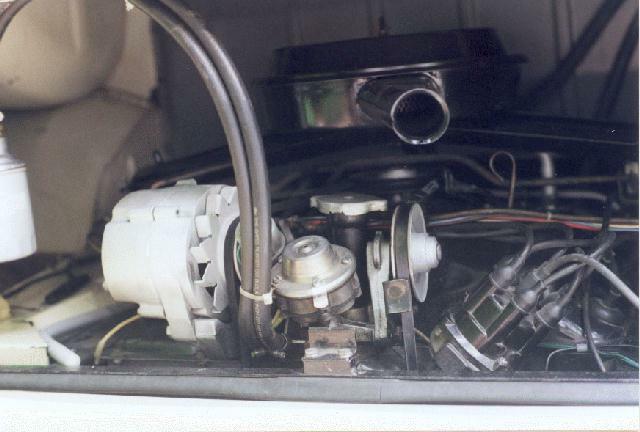 The only other major modification was the removal of the oil bath air cleaner pedestal, but it did seem that it would've been possible to simply bend it back out of the way to achieve the minimum clearance needed. Bringing this back to stock would require only two lines of weld and finishing, and welding the air cleaner pedestal back. 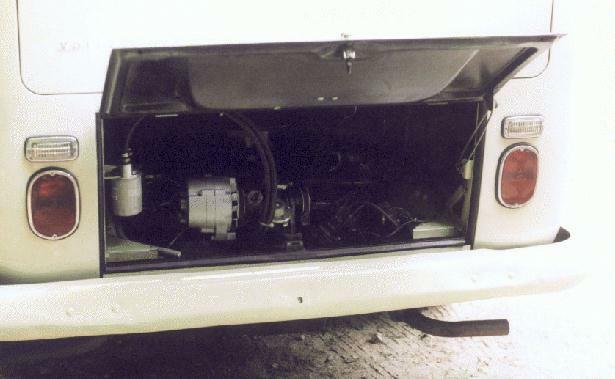 No other metal was removed, and in all other spots, adapters were used to retain the stock bus so that swapping back to stock could be done with ease. Rear torsion springs were adjusted to correct for the additional weight. The rear engine apron was removed and a simple custom made piece was inserted in its place to clear the longer Corvair engine. It was witnessed pulling up long climbs in the Berkshires effortlessly. Kudos to Trevor on a thoughtful conversion! When he gets his webpage up this writeup will be replaced with a link to his page, so check back for changes. Until then, you can email Trevor with questions.